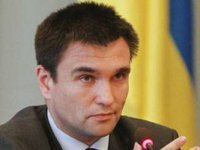 Ukrainian Foreign Minister Pavlo Klimkin has said he intends to visit Zakarpattia region in the near future to meet with the Hungarian, Slovak, and Romanian communities. "I will soon go to Zakarpattia region. I will meet not only with the Hungarian community, but also with the Slovak and Romanian ones," he said at a joint press conference with Slovak Foreign Minister Miroslav Lajcak in Kyiv on Thursday. According to him, the Hungarian and Ukrainian sides talk about the importance of holding consultations on how the whole range of consular services will be carried out.